This is the fourth consecutive fiscal year for which CVWD has received this award. In order to receive this award, CVWD had to publish a budget document that meets GFOA program criteria as a policy document, an operations guide, a financial plan and a communications device. The GFOA uses a panel of independent reviewers to examine the budget documents of award candidates. 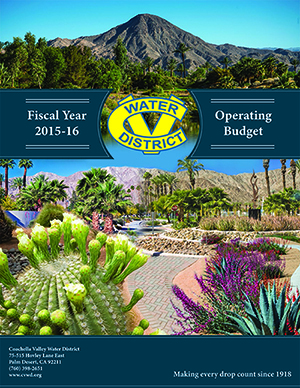 The budget is available for review at CVWD's website, www.cvwd.org. Printed copies are also available for review at the district's Steve Robbins Administration Building in Palm Desert. The GFOA is a nonprofit professional association with nearly 18,000 government finance professionals as members throughout North America. The Distinguished Budget Presentation Awards Program is the only national awards program in government budgeting. CVWD also received the award for fiscal years beginning on July 1 in 2012, 2013 and 2014.